Aldehydes, ketones, 1° alcohols, etc. An inert hydrocarbon skeleton onto which functional groups (FGs) are attached or superimposed. The functional group approach "works" because the properties and reaction chemistry of a particular functional group (FG) can be remarkably independent of environment. Therefore, it is only necessary to know about the chemistry of a few generic functions in order to predict the chemical behaviour of thousands of real organic chemicals. Chloro, bromo and iodo alkyl halides are often susceptible to elimination and/or nucleophilic substitution reactions. Primary alcohols have an -OH function attached to an R-CH2- group. 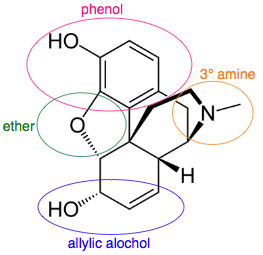 Secondary alcohols have an -OH function attached to a R2CH- group. Secondary alcohols can be oxidised to ketones. Tertiary alcohols have an -OH function attached to a R3C- group. Tertiary alcohols are resistant to oxidation with acidified potassium dichromate(VI), K.
Aldehydes have a hydrogen and an alkyl (or aromatic) group attached to a carbonyl function. Aldehydes are easily oxidised to carboxylic acids, and they can be reduced to primary alcohols. Aldehydes can be distinguished from ketones by giving positive test results with Fehlings solution (brick red precipitate) or Tollens reagent (silver mirror). Aldehydes give red-orange precipitates with 2,4-dinitrophenyl hydrazine. Ketones have a pair of alkyl or aromatic groups attached to a carbonyl function. Ketones can be distinguished from aldehydes by giving negative test results with Fehling?s solution (brick red precipitate) or Tollens reagent (silver mirror). Ketones give red-orange precipitates with 2,4-dinitrophenyl hydrazine. Carboxylic acids have an alkyl or aromatic groups attached to a hydroxy-carbonyl function. Carboxylic acids are weak Bronsted acids and they liberate CO2 from carbonates and hydrogen carbonates. Esters have a pair of alkyl or aromatic groups attached to a carbonyl + linking oxygen function. Esters can be shown in text as: RCOOR or (occasionally) ROCOR. This is an acid catalysed equilibrium. Primary amides (shown) have an alkyl or aromatic group attached to an amino-carbonyl function. Primary amines have an alkyl or aromatic group and two hydrogens attached to a nitrogen atom. Primary amines are basic functions that can be protonated to the corresponding ammonium ion. Primary amines are also nucleophilic. Secondary amines have a pair of alkyl or aromatic groups, and a hydrogen, attached to a nitrogen atom. Secondary amines are basic functions that can be protonated to the corresponding ammonium ion. Secondary amines are also nucleophilic. Tertiary amines have three alkyl or aromatic groups attached to a nitrogen atom. Tertiary amines are basic functions that can be protonated to the corresponding ammonium ion. Tertiary amines are also nucleophilic. Acid chlorides, or acyl chlorides, have an alkyl (or aromatic) group attached to a carbonyl function plus a labile (easily displaced) chlorine. Acid chlorides highly reactive entities are highly susceptible to attack by nucleophiles. Acid anhydrides are formed when water is removed from a carboxylic acid, hence the name. Nitriles (or organo cyanides) have an alkyl (or aromatic) group attached to a carbon-triple-bond-nitrogen function. Note that there is a nomenclature issue with nitriles/cyanides. If a compound is named as the nitrile then the nitrile carbon is counted and included, but when the compound is named as the cyanide it is not. For example: CH3CH2CN is called propane nitrile or ethyl cyanide (cyanoethane). Carboxylate ions are the conjugate bases of carboxylic acids, ie. the deprotonated carboxylic acid. Carboxylate ions can be shown in text as: RCOO? When the counter ion is included, the salt is being shown. Ammonium ions have a total of four alkyl and/or hydrogen functions attached to a nitrogen atom. Quaternary ammonium ions are not proton donors, but the others are weak Bronsted acids (pKa about 10). Amino acids, strictly alpha-amino acids, have carboxylic acid, amino function and a hydrogen attached to a the same carbon atom. There are 20 naturally occurring amino acids. All except glycine (R = H) are chiral and only the L enantiomer is found in nature. Alkenes consist of a C=C double bond function. Alkenes are planar and there is no rotation about the C=C bond. Alkenes are electron rich reactive centres and are susceptible to electrophilic addition. trans-alkenes are 1,2-disubstituted functions with the two R, X or other groups on opposite sides of the C=C function. Due to the non-rotation of the C=C bond, cis and trans geometric isomers are not [thermally] Interconverted. cis-Alkenes are 1,2-disubstituted functions with the two R, X or other groups on the same side of the C=C function. Due to the non-rotation of the C=C bond, cis and trans geometric isomers are not [thermally] Interconvertion. Ethers have a pair of alkyl or aromatic groups attached to a linking oxygen atom. Ethers are surprisingly unreactive and are very useful as solvents for many many (but not all) classes of reaction. Alkoxide ions an alkyl group attached to an oxyanion. Alkoxide ions can be shown in text as: RO? Sodium alkoxides, RONa, are slightly stronger bases than water and so cannot be prepared in water. Instead they are prepared by adding sodium to the dry alcohol. Hydroxynitriles (also called cyanohydrins) are formed when hydrogen cyanide, H+ CN?, adds across the carbonyl function of an aldehyde or ketone. Primary carbocations have a single alkyl function attached to a carbon centre with a formal positive charge. Carbocations - also and more correctly called carbenium ions - are important reactive intermediates implicated in electrophilic addition reactions and electrophilic aromatic substitution reactions. Secondary carbocations have a pair of alkyl functions attached to a carbon centre with a formal positive charge. Tertiary carbocations have three alkyl functions attached to a carbon centre with a formal positive charge. Acyl cations have an alkyl (or aromatic) group attached to a carbonyl function with a formal positive charge. Acyl cations are important reactive intermediates and are implicated in electrophilic addition reactions and electrophilic aromatic substitution reactions. Acyl cations are commonly formed from the corresponding acyl/acid chloride plus aluminium chloride. Polymers consist of small monomer molecules that have reacted together so as to form a large covalently bonded structure. There are two general types of polymerisation: addition and condensation. Linear chain polymers are generally thermoplastic, while three dimensional network polymers are not. Diols and polyols are alcohols with two or more -OH functions. Diols and polyols are very soluble in water. They are used as high temperature polar solvents. This free, open access web site is an ongoing project and your input is appreciated.